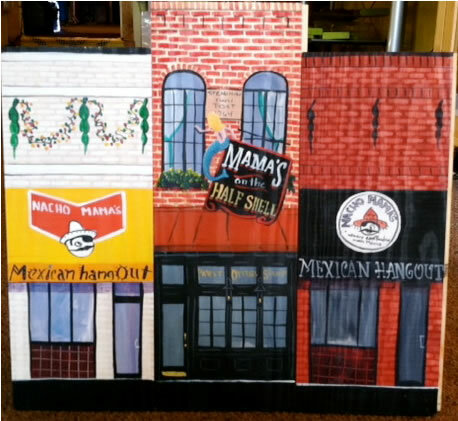 Request your Hand Painted Wood Panels for Nacho Mamas or Mamas on the Half Shell from artist Linda Amtmann. We have many favorite places in the Baltimore neighborhoods of Canton. Each wood panel is sold individually. Hand Painted Wood Panel for Nacho Mama's or Mama's on the Half Shell. These are painted on actual wood panels. Each hand painted brick / wood is sold individually. Choose from Nacho Mamas (white/yellow facade from 1994-2009), Nacho Mamas (brown facade from 2009-current), or Mamas on the Half Shell. If Gift Wrap and/or Gift Card desired, please note in Comments during Checkout.